Medium hard, matte jumbo pencil. 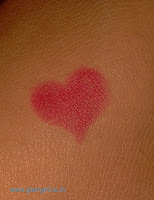 great staying power makes it an alternative for lip liner used by professionals for coloring lips. Moisturizing properties achieves by the complex of lanoline substitutes and avocado butter. Paraben free formula not testes on animals. 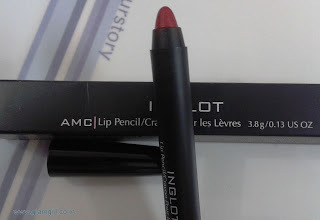 Inglot offers a wide range of lipstick. I am reviewing jumbo matte lip pencil in 21 which is red color lip pencil. Besides using as lipstick, I use it as base under red lipsticks to get better coverage. It is long lasting even stays after meals. It will suit medium to fair skin. I prefer using it after lip scrubbing. Its a little drying formula so in winters wear it on lip balm. If you love wearing matte colors and if you are looking for matte red then this is the lipstick for you. You can buy it without second thought. Will I buy it again: Yes, but other shades. I recommend it: to those who love wearing matte lip colors.